Sandy Vrem and Michele Olsen participated in a workshop featuring Laura Wait and sponsored by the San Diego Book Arts guild. The workshop seemed like a good excuse for Sandy to drive down from Arcata and Michele to fly out from Nebraska so that we could combine pleasure (the workshop) with joy (we have children living in San Diego) and play (roller coaster and carousel at Belmont Park). Friday evening we attended Laura Wait’s lecture, “Playing it by Ear” at the beautiful Athenaeum Music and Arts Library in La Jolla. The library was founded by six women in 1894 and started its artists’ books collection in 1991. Books are displayed on shelves and in display cases throughout the rooms in their charming facility. With wine and cheese in hand we enjoyed Laura's slideshow of her beautiful books shown on a scale big enough that we could appreciate the detail. Laura’s work is featured in 500 Handmade Books; her book is on the cover with additional books inside. 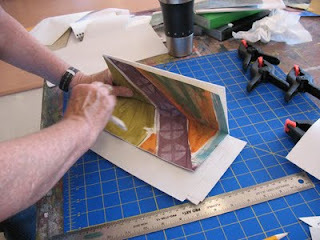 The first day of the workshop was devoted to painting papers to be used for book pages. 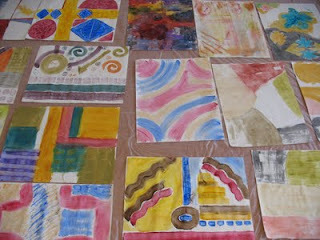 Laura used wheat paste with glycerin (for flexibility), green soap (discourage bugs), and acrylic paints. 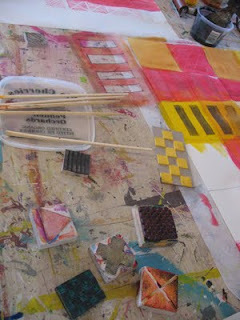 The use of brushes, rollers, sticks, and sponges, resulted in spontaneous creations. 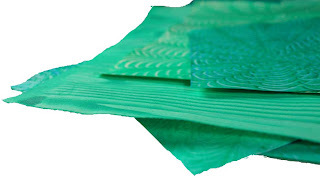 The first layers of paint were left to dry while we started work on tools to create more complex layers. The beauty of Laura’s work lies in her use of multiple layers of paint to create complex and rich visual images. We worked with stencils cut from Mylar, stamps cut from erasers, and my personal favorite, stamps created out of Fun Foam. Any of these tools could be used to create positive and/or negative images. Ideally work on the images would take place over a number of days. We spent time exploring the use of writing as an additional layer. The writing can be legible or not, small or big. Here Laura is writing in ink using a chopstick. She may repeat words over and over writing them close together or stacked. 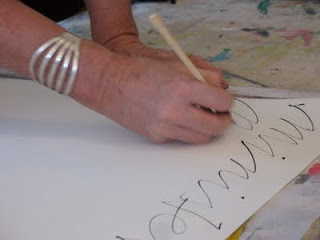 She also writes in fresh paint with a stick revealing colors of paints that are underneath. The second day we used the painted pages to create a drum leaf book. This type of binding was developed by Tim Ely in order to better display artwork. You can see a description of it from the e-journal Bonefolder, Vol. 1, No. 1, 2004. I found this article very hard to follow. 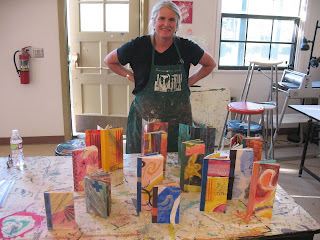 You might try the instructions by Dorothy Simpson Krause in Book + Art, Handcrafting Artists’ Books. Sandy is gluing one page to the back of another page in her book; you can also see some of her really wonderful artwork. At the end of the workshop the twelve participants had created these beautiful books. November's Meeting: Another Swap, Sale and Share Event! We apologize for getting the workshop info posted so late this month. Most months we plan to have it up much sooner. That said, November's workshop won't be a workshop. Instead, we'll be having a pre-holiday sale, swap and share event. Think of this as an eccentric and fun book arts swap meet. We'll also be having a tips and ideas exchange. Do you have a tool you love? A method of doing something that you don't think many others know about? Please come share it with us. Are your piles of unused supplies getting to be a bit much? Do you have extras you'd like to sell? How about craft books and magazines? Bring 'em! Get some cash to restock with more supplies. Or offer them in trade...the choice is yours to make. Also keep in mind that the winter holiday season is only a month away. 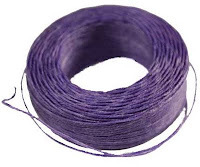 Have you made any little gift items that you think your fellow bookmakers might want to buy? Supplies, stuff to destash, stuff to sell, stuff to give away...also please consider bringing a favorite tool or material to share in our tips exchange. Or just come to browse and enjoy the company. Further information can be found in the November newsletter. One lovely Mother's Day a couple of years ago my daughter gave me a copy of The Book as Art: Artists' Books from the National Museum of Women in the Arts. (Note: part of the NORBAG library) This book has almost 200 pages of photographs of fabulous books by many of the premier women book artists in the world AND these books are among the more than 800 in the permanent collection of the museum. I knew that I had to visit this place. The opportunity finally came when we spent a week in the Baltimore/Washington D.C. area with our friends from Germany. 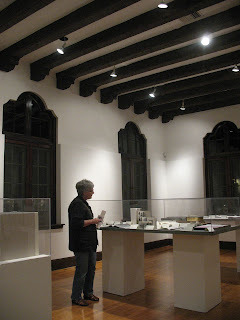 The exhibit we were able to see, Hard Copy: Book as Sculpture, runs through January 17, 2010. Unfortunately, it was a small exhibit of only 15 books while the hundreds of other artist books were not on display. 2) Images of the books are available using the link below. Look under "Press Kit" and click on "Illustrated checklist (pdf)" and/or "Press Image Gallery". Note from Michele: It was a real treat to see these books as most of the artists were unknown to me. If any of you know of other internet sites featuring these artists, please leave as a comment. Thank you Bonnie! A member alerted us that the Humboldt Arts Council on F Street in Eureka is having a free screening of Between the Folds by Vanessa Gould on Thursday, Nov 5 from 6–7:30 PM. It “chonicles the stories of 10 fine artists and intrepid theoretical scientists who have abandoned careers and scoffed at hard-earned graduate degrees—all to forge unconventional lives as modern-day paperfolders." If you can’t make it, we've been told that PBS will also be broadcasting this on TV later in the year. We’ll let you know when we get more info on when it will be shown.